Shawna and I after filming a few workout videos! 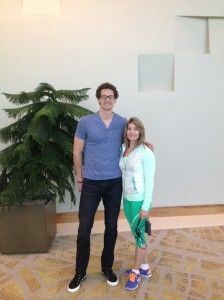 When I was in Vegas recently for a fitness mastermind meeting and I got to meet up and talk with one of the most sought after experts in the industry, Shawna Kaminski. Shawna is just so much fun to be around and is so knowledgable when it comes to fitness (and not to mention she is super fit… See below). In all her awesomeness, we were able to put together a quick video for you that discusses some ways that you can start building into doing more burpees, no matter what fitness level. Shawna gives us some great insight on how to build into doing more and more burpees whether you are a beginner or advanced. We both agree that the burpee is one of the best exercises around. And Shawna thinks so highly of them that she has actually put together a FULL BURPEE WORKOUT PROGRAM! As you heard me say in the video… You have a challenge on your hands. If you can beat my 50 burpees as fast as possible time of under 3-minutes you get a FREE gift (since this video I broke my record and now have a new record 5o burpees in 2 minutes and 51 seconds). Now here’s the thing… an incredible way for you to build into beating my burpee challenge (and keep your workouts interesting) is to follow the workout flow of Shawna’s challenge burpee program. ==> Click here to check out Shawna’s Challenge Burpee program <==== Old School! So it is safe to say that this super-fit lady knows what she is talking about and has your back when it comes to intense workouts. If that isn’t enough to convince you to ‘Do the Burpee’… I don’t know what will… I’m off to go beat my 2-minutes and 51-second record. Wish me luck!